Discover Uganda and Rwanda for Budget Gorilla Trekking tours, Chimpanzee Tracking, Golden monkey trekking, Bird watching, Uganda Gorilla habituation, Big Five animals, Mountain climbing, White water rafting, Wildlife game drives, Culture and beautiful landscapes. Our safari tours are available for all Budgets including Shoe-string(Budget), Midrange and Luxury(Up-market). Gorilla trekking is one of the safaris done in Uganda. Gorilla trekking Uganda involves moving through the forest of Bwindi or Mgahinga tracking these great apes. The trek can be strenuous sometimes because the gorillas keep on moving from one location to the other. The movement of the gorillas depends on the location of the food. Mountain gorillas (Gorilla beringei beringei) are native of the Virunga Conservation area, an area covering Uganda, Congo and Rwanda. Apart from Virunga's, these apes can also be found in Bwindi forest National Park. Many of the gorillas that are known are lowland western gorillas located in Central West African countries. The gorillas in Uganda are part of the eastern gorillas living in high altitude places usually between 2,200m–4,300m. Mountain gorillas have over 95% of human DNA this makes them the closest to humans only second to Chimpanzees. These primate species are endangered having been hunted by early settlers and local people to almost extinction. However efforts have been made to revive the population of these apes and this is mainly through the gorilla trekking safaris that help to conserve these gentle giants. According to Wikipedia, Mountain gorillas mostly eat foliage, such as leaves, stems, pith, and shoots (especially bamboo), while fruit makes up a very small part of their diets. Mountain gorilla food is widely distributed and neither individuals nor groups have to compete with one another. Their home ranges average 3–15 km2, and their movements range around 500 m or less on an average day. Despite eating a few species in each habitat, mountain gorillas have flexible diets and can live in a variety of habitats. An adult mountain gorilla can eat about 30kg every day. Mountain gorillas in Uganda are located in two national parks. The first group is located in Bwindi impenetrable national park. Bwindi impenetrable forest is a home to half of the mountain gorillas in the world. Gorillas are also located in Mgahinga Gorilla park which is found on the border of Uganda and Rwanda. The gorillas in this forest keep on moving between Uganda, Rwanda and Congo. However recently the movements of these gorillas have been stable in Uganda. Mgahinga gorilla park has only 1 gorilla group. What is the best time to go Gorilla trekking? Gorilla trekking just like Chimpanzee trekking in Uganda is an all year through activity, however there are 2 seasons; high and low season. The best time to go for a Uganda gorilla trekking Safari depends on the 2 rainy seasons. The rainy seasons is usually between March - May and October - November. Therefore it best to come between December - March and June - September, but also in the other months, gorilla trekking can be done successfully. The minimum age to go gorilla trekking in Uganda /Rwanda is 15 years. Therefore you are advised to confirm the age of your children in case you want them to track the gorillas with you. Make sure on booking the gorilla tour, you send copies of passports of the participants including the children that are 15 years old and above. The child below the 15 age limit will not be allowed to trek. The rules are strict here. Gorilla permits booking is a responsibility of Uganda Wildlife Authority, head office in Kampala. Booking can be done on an individual basis or through Gorilla and adventure Safaris. It is advisable to book for a gorilla permit months before the actual gorilla trekking date. This helps in organizing your gorilla trekking tour in time. During the peak season, getting a permit is very hard due to high demand. Therefore booking a permit 3 months before the travel date is advised. How physically fit should I be before going for a Gorilla trekking Tour? You should be in good physical condition. If you are sick or do not feel well, then it is recommended that you should not do the trekking. Trekking can be tiresome and sometimes it can take the whole day, therefore being physically fit comes in handy. Rwanda gorilla trekking is a bit expensive for an average budget traveler. However in case you have very limited time (2 days) and you want to have this experience at a low cost, the option of doing Uganda gorilla trekking from Kigali is a very good option. The tour starts in Kigali the capital of Rwanda and the gorilla trekking safari can be done either in Bwindi Impenetrable national park of Mgahinga Gorilla park. Checkout our 2 days Uganda gorilla trekking tour in Bwindi/Mgahinga. If you also do not want to travel long distances to see the gorillas, then the option of doing your Gorilla trekking tour in Uganda from Kigali is recommended. Just like Rwenzori Mountain Trekking/Hike, Gorilla trekking also requires these items when tracking the gorillas. F&M Adventure Safaris Limited is a Ugandan Tour Operator company owned and run by indigenous wildlife enthusiastic individuals and it has been in tourism industry since 2010. F&M Adventure Safaris Limited has been able to fulfill its promise and mandate of providing top notch Budget, Mid range and Luxury tour services to its guests from all over the World, and our services run in the 2 East-African countries of Uganda and Rwanda. We are also registered with Association of Uganda Tour Operators (AUTO) and we are have a licence to carryout Tours in Uganda and Rwanda. With our experience and expertise in Guiding, Planning and execution of Safaris, we are very confident of providing you a worthwhile and unforgettable East African Wildlife Adventure in the “Pearl of Africa and the Land of a thousand hills”. Mountain gorillas today can be found in Uganda, Rwanda and DRC(congo) only. That’s why this region is a leading tourist destination in the World today. The two countries Uganda and Rwanda are also blessed with variety of rich culture and wildlife including the largest concentration of Chimpanzees (and other primates), the big five(Lions, Elephants, Rhinos, Leopards and Buffaloes), Giraffes, Hyenas, Deers, Hippos, Zebras, Cheetahs, Elands, Impalas, Bushbacks, Crocodiles, Antelopes and so many more wildlife. Uganda has over 1036 bird species such as ( Shoebill, African Green Broadbill, Pied Kingfisher, African fish Eagle, Great Blue Turaco, Shelley's Crimsonwing, Standard-winged Nightjar, Short-tailed Warbler,) and many more, a total that surpasses the number in North America and Europe combined, providing a heaven for any Bird watching enthusiast. The two countries also provide other activities including Mountaineering, Sport fishing, White water rafting, Cultural tours and Habituation tours for (Lions, Chimpanzees and Mountain Gorillas). F&M Adventure Safaris provides unbeatable and friendly Safari packages that will make your vacation a memorable and an unforgettable experience in Uganda and Rwanda. Some of our Safari packages include Uganda Gorilla Trekking Tours in Bwindi impenetrable National Park, and Mgahinga Gorilla park, Rwanda Gorilla Trekking tours,in Volcanoes National park, Chimpanzee trekking in Kibale forest National Park and Nyungwe forest in Rwanda, Uganda Tree climbing Lions in Queen Elizabeth National Park, Game drives in Murchison falls National Park, Kidepo valley National Park , Lake Mburo National Park, lake Bunyonyi for relaxation and canoeing, mountain and nature walking excursion on slopes of mt Rwenzori and mt Elgon in the east the home of the beautiful Sipi falls and so much more. We are pleased to have the best tour guides. They are professional, knowledgeable, friendly and experienced and they will make your tour memorable. This safari takes you to bwindi impenetrable national park for mountain Gorilla trekking. The 3 days gorilla tracking tour give you an exclusive opportunity to experience one of the best attractions in the world. 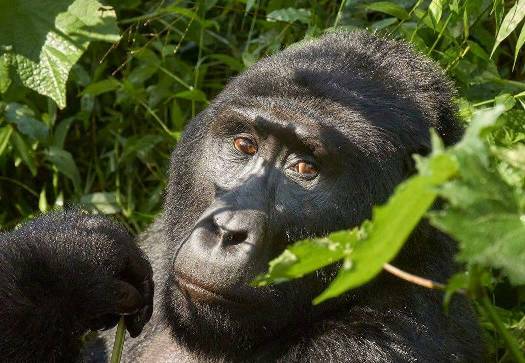 This 5 day Gorilla and Chimpanzee trekking Safari tour gives you an exclusive encounter with Uganda's Primates in Bwindi Impenetrable and Kibale National parks. The tour can also be done in 4 days. This is a great trip to Murchison falls National park for magnificent view of Wildlife on the banks of river Nile and in the Wild. The trip give a chance to see Africas big Five in the shortest time possible. Bwindi host more than half of the world's remaining mountain Gorillas. This park is heavily forested and is famous for its incredible Gorilla trekking tours and Bird watching. Murchison falls national park has lot to offer; Wildlife, Big five and Birdwatching, A vast vegetation cover ranging from dense rain forests, woodland, grassland, bush land and open savanna. This is a home to the largest concentration of Primate species in the world, including Chimps, Redtailed monkeys, Golden monkey, Black and White colobus, White nosed monkeys, etc. This is the second highest point in Uganda. 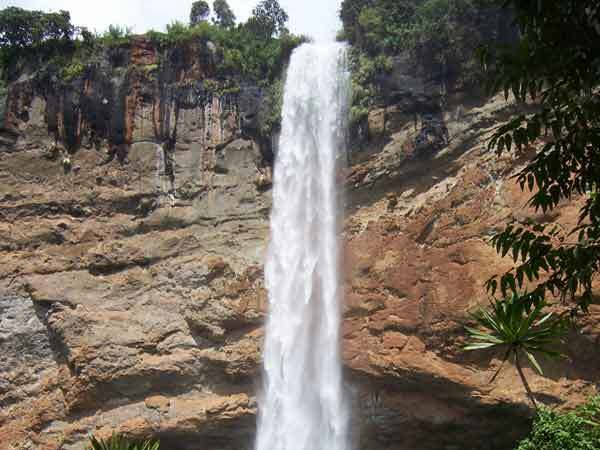 The mountain is easy to climb and is famous for the breathtaking Sipi falls, Wildlife and various Bird species etc.